Well, I’ve got to say that I’ve learned a lot about coconut oil! When I first started blogging my recipes here, I hadn’t discovered coconut oil yet. I used macadamia nut oil in my baking and it was great. Then I heard about coconut oil, did some reading and found some at my local health food store and then in the Asian section of my supermarket. I use coconut oil in almost all of my recipes. It has wonderful benefits to our bodies because of its Lauric Acid. It contains antifungal, antibacterial, antiviral properties that boost the immune system. (Coconut oil is almost 50% Lauric Acid). AND it boosts metabolism and aids with weight loss. :) Lovely. But I’ve heard a lot of discussion about different brands of coconut oil. 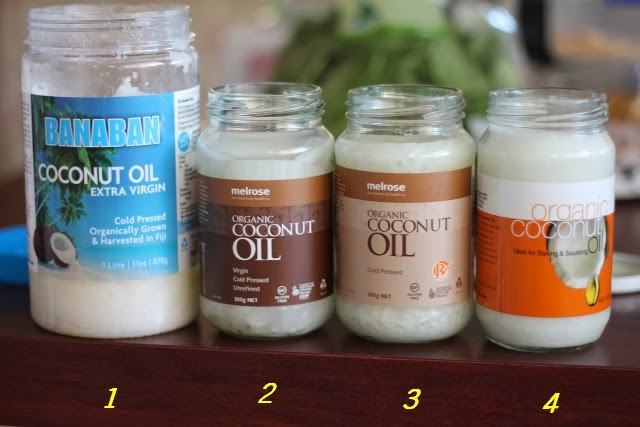 Which one tastes the best, what does cold pressed, unrefined or virgin coconut oil mean? Does it matter if it’s organically grown and harvested? What about where the coconuts are grown? And really, WHICH ONE SHOULD I BUY? Number 1 is Banaban Extra Virgin Coconut Oil – Cold Presssed , Organically Grown & Harvested in Fiji. (1 Litre $15 from www.mypaleo.com.au or about $19 from my local Health Food Shop). 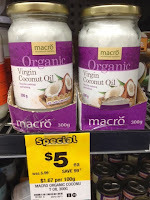 Today as I was doing my grocery shopping at Woolworths I found ANOTHER new coconut oil. So first of all I did a taste test. 1 – My jar of Banaban has a slightly lumpy texture. It clumps together more than the other brands, which makes it not as smooth to eat straight from the jar. It has a light coconut flavour. I bought another jar just to check if they are all a bit lumpy; the second jar was as well. But the different texture doesn’t bother me and it surely won’t make any difference once it’s melted. 2 – This was my favourite to eat straight from the jar. It has a light coconut taste and is creamy and smooth in texture. 3- This is the only jar that didn’t taste like coconut. I didn’t really like it, but maybe it would be good if you were cooking something that you didn’t want to taste coconutty. On the lid it says it’s great for cosmetic uses, I guess since you can’t smell or taste the coconut. 4- This one tastes pretty much like numbers 1 and 2- slightly coconutty with a smooth texture. 5- I like this one better than number 4, and it’s very similar to the others. So taste-wise, I like numbers 1 & 2 the best. But what confuses me most about this coconut oil is all the information that’s written on the jars. I’ve done some research and I’ll try and explain what I’ve found out. · I’ve found unrefined coconut oil is best because the refining process uses harsh chemicals. No thank you very much! · Unrefined coconut oil is usually labelled ‘virgin’ or ‘extra virgin’ and there doesn’t seem to be a consistent description of each. Either one, though, means the first pressing of fresh, raw coconut without the addition of any chemicals. That’s good! There are different methods of extracting oil from the coconuts; cold-pressed, expeller-pressed or centrifuged and all can be used for both refined and unrefined varieties. All methods can create a good, healthy oil. Sometimes expeller-pressed and cold-pressed oils are heated to high temperatures and this can make the flavour more coconutty. If you want a mild coconut oil, centrifuged oil may be the way to go. So that’s it folks, I think I understand coconut oils a bit better now. I’ll only buy the unrefined type and my favourites are the Banaban from the health food shop and the Melrose dark brown jar from Coles. My kids are complaining that there’s no room for food now in the pantry because it’s full of coconut oil, but I’ll let you know if I notice any differences when I use the different brands in my cooking. Thanks so much for this post! I'm always so confused by the different brands/labels it's great to learn more. I've tried most of those brands and now want to try a couple more! Thanks for that interesting post and for doing the research! I've used most of those but not tested them for different qualities. Your post taught me some great info I didn't know such as the difference between 'refined' or 'unrefined'. So thank you! Thanks for the encouragement, Clint! It's very confusing and I'm still not sure I've got it all sorted out. I'd like to know which country it's best to buy from, I'll have to see if I can find any info on that. Thankyou so much for your review! Make a lot of sense to me now as I am just starting out slowly with my coconut oil use - after a bad reaction the very first time. Danielle. It really make sense. Thank you for this helpful tips. It really works the coconut oil for me. Thank's for this! This post belongs to a very good healthy information. Thank you for post this post. I am very glad to read this post. Hope you post your next post soon.